Fix iPod Touch at Sydney Local Company - Most Trusted IPhone Repair Specialist. Iphone 3GS/4/4S/5/5c/5s, IPAD 2/3/4, Mini, Air, IPod Touch 4. Nobody can fix it? Bring It On. Apple who is one of the well-known producers of high-tech technology across the world first introduced a musical device known as the iPod in the year 2001. The device has really come a long way in serving people to their musical satisfaction since it was introduced. The iPod has hugely transformed the music industry and also keeps on redefining the popular MP3 players from across the world. The iPod Touch which is one of the successful advancements of the first generation of iPod has the ability to play music, television shows and also movies. Web browsing and playing several games are also part of its incredible features. 1.1 Apple who is one of the well-known producers of high-tech technology across the world first introduced a musical device known as the iPod in the year 2001. 1.3 Fixing your iPod Touch at this repair company is even more economical and quicker than sending it back to Apple for repair. 1.4 Nevertheless, people who are not by any chance around Sydney or Australia can also get fix their iPod Touch in this company. 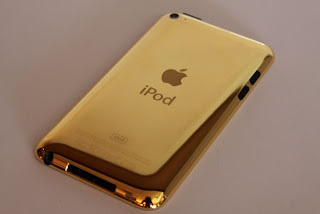 1.6 Have you seen 'Real 24ct Gold iPod Touch' ever before ? 1.7 It's Available For Our Customers Only. 1.9 please click here to see '24ct Gold iPod Touch'. they tend to carry it along to wherever go. The extensive usage of this devise or perhaps, the accidental scenario that might surface in which the device falls on the ground and some of its parts such as the screen cracked or ceased functioning, does call for the need to Fix iPod Touch. Whenever such scenario surfaces, it is very much advisable to look for an iPod touch repair company to get it fixed. Instead of condemning or throwing the device out and be struggling to get another one, this shop can save you hundreds of dollar. You might require not more than a token to get your iPod Touch back to its normalcy. Fixing your iPod Touch at this repair company is even more economical and quicker than sending it back to Apple for repair. Normally, it takes more than ninety days before you can get your device back from Apple if you send it to them for repair. But this company repair does not take more than twenty four hours and you can get your device back in no time. This company is situated at Sydney in Australia and it has a bunch of professionals that could get your device fixed in a very short time. People in Sydney and it’s environ or even Australia at large can reach them locally. They are iPod Repair Sydney Specialist which is one of the few Apple Repair Specialists Alliance members. Nevertheless, people who are not by any chance around Sydney or Australia can also get fix their iPod Touch in this company. They are available online you can log on to their official website and let them know what your problem is with your iPod Touch. If you log on to their site, you will be given direction on how to go about sending your broken device over to them. As I have earlier mentioned, the repair won’t take more than twenty four hours and as such you will get your device back within the interval of a week. the repair to your device will be done without loosing any of your saved data or documents most especially your songs and games. Also the settings of your device would not be altered during the repair. This company is your best belt to fix iPod Touch. Their service is cheap and real.